Efficiency is higher than the last series (ETP6/ETP5) over one time. Pump head is long-life and maintenance-free. 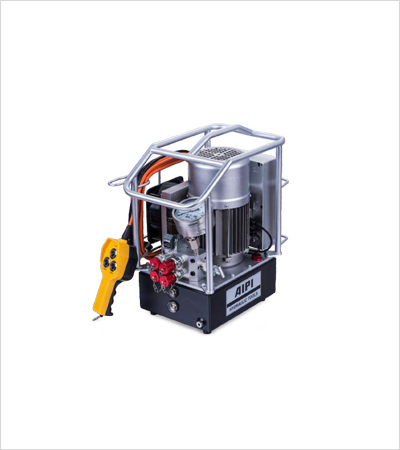 Light weight, high speed, large flow, high efficient, particularly suitable for large hydraulic wrench. One pump can drive four hydraulic wrenches at the same time. Auto-operated module. Tighten or loosen the bolts via pushing the button only after setting the pressure. Adopt specialized PCB to achieve the functions:automatic stop after one minute of no-operation, automatic decompression after stop, overload protection for motor. With high-power radiator to ensure non-stop run for a long time. Adopt triphase high power and efficient motor,maintenance-free long-life, be able to start under pressure.Light weight, high speed large flow, high efficient. Adopt purpose made pressure regulating valve,valve element is wear-resisting,longer life,more stable pressure. Start at any time under pressure. Integrated manual and automatic switch control. In automatic mode, it start working after setting the pressure value. All models meet CE safety requirement. Different Voltage (115, 230, 380, 415 and 440 voltage) & Frequence (50/60Hz) are available. Flow rate of the pump at 50Hz will be higher at 60Hz.